“The achievement of the 2030 Agenda for Sustainable Development and the Sustainable Development Goals (SDGs) will require all hands on deck. It will require different sectors and actors working together in an integrated manner. 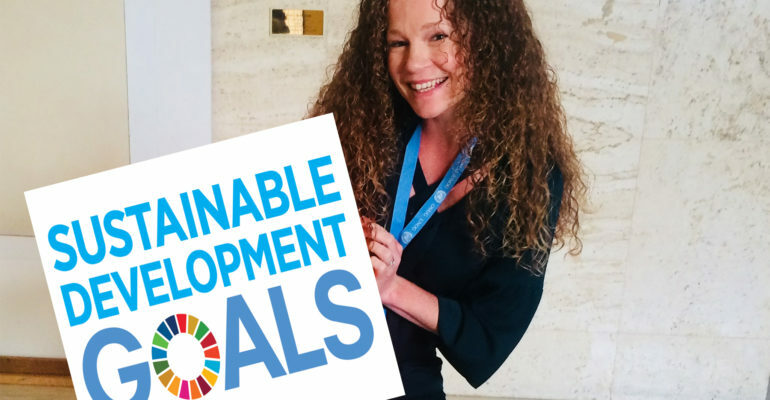 To help leverage expertise and knowledge into policy, practice, and action, the SDG Lab in Geneva hosts an interactive dialogue called the “So What” Series. I first introduced the “So What” Series in a previous blog post where we discussed the City of Geneva’s work to transition its gender equality initiatives from written statements to impactful actions. Link. Next to talk on the “So What” Series panel was Ms. Jane Townsley. Jane is the Director of Force International Ltd, providing expert international policing and gender advice, delivering bespoke solutions for the design and implementation of police training. A police officer for 27 years, Jane is also the former President of International Association of Women Police. When asked, “Why should women be more involved in urban environment planning and security?” Jane was quick to offer three great examples for us to use within our own communities. Take the opportunity to design out crime. We talk a lot about ‘collaboration’ when discussing implementation of the SDGs, yet we know there is still much progress to be made between moving from talk to action! Ms. Townsley pointed out that traditionally, policing, security, and safety are brought into city planning in silos. From her experience, successful city planning and development incorporates both police and women during the early stages and this continues through to implementation. In doing so, we can work to ‘design out crime’ and make safer cities from the very beginning. What if your city is already well established? Involving women in your city’s continued development will insure you’re taking a well-rounded view of future planning and security initiatives. ‘Safety’ is often a hidden link to accomplishing our gender objectives. Ever walk alone in your town or city during the early morning or night hours? How did you feel? Were there dark or dimly light sections along your way? How did you respond to these areas? Now, picture how you’d respond if you had to walk to your early shift at the hospital or bakery. How do you think a child would feel in this situation as they walked to school in the morning? Unbeknownst to many, safety within our communities is often a key link to insuring equal opportunities in employment, education, and our daily lives. Personally, I always feel a little uncomfortable in parking garages. Especially at night, but even in the daytime, I find there are too many areas where I feel unsafe. This is why I appreciate parking at the parking garage across from the United Nations in Geneva, because there are a few (30+) places reserved for women in the front of the parking garage and under 24/7 surveillance! 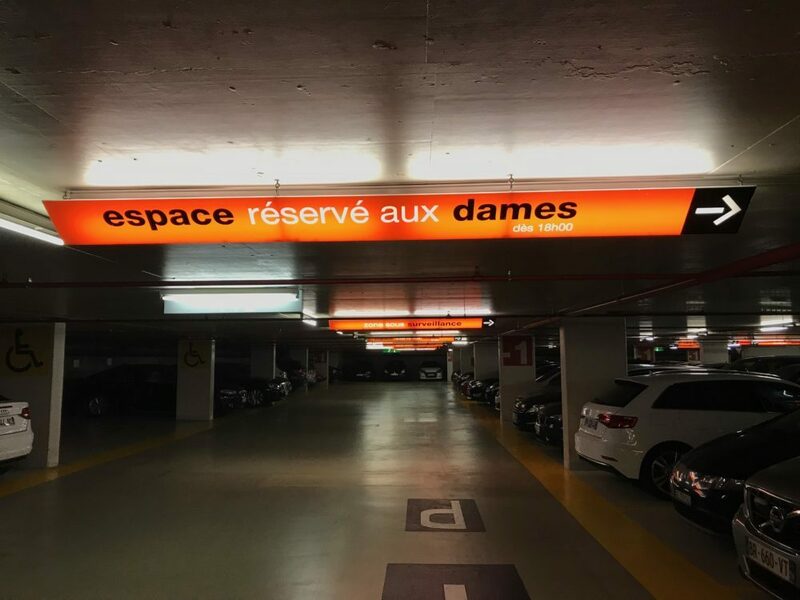 “Espace réservé au dames” ought to be found in all garages. Safe cities promote women and a positive economic impact within our communities. We’ve seen how safe cities can elevate women and stimulate equality throughout our communities, but did you think about how this also positively impacts the city’s economic development? For example, the annual carnival festival in London was notorious for sexual harassment violations on women in public spaces… during the day time. So the metropolitan police had to devise new ways to address and end these offenses. As a result, they developed new tactics for monitoring public spaces, predicting potential issues, and stopping offenses without drawing the negative attention of carnival participants. In all, the metropolitan police were able to keep women safe, while also maintaining the fun (and profitable) ambiance of the carnival festival. To provide another example, Ms. Townsley described a city who won a bid from a corporation to build a new manufacturing plant within the city limits. In addition, the city was excited about corporation’s promised to hire and train women from the city. All seemed well until the corporation faced difficulties in attracting women applicants. After some research, they found a number of issues that were detracting women from applying, including lack of safe and reliable transportation to the site, dimly lit streets around the site, and incompetence to consider the alignment between school and working hours. Consideration of these elements would not only benefit the new corporation but other businesses within the city. Share your stories and examples in the comments below!